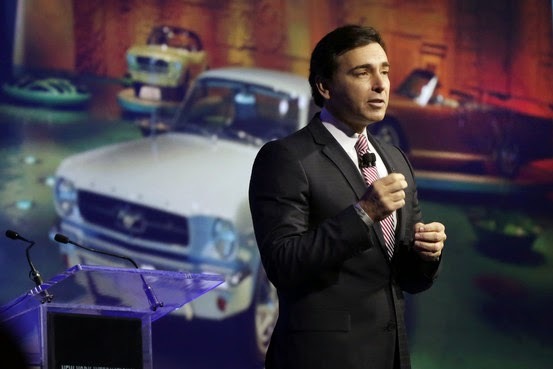 Ford Motor Company has announced that Mark Fields will become the company’s next CEO replacing Alan Mulally. Presumably Henry Ford is rolling in his grave since Fields, a Jewish man whose family changed the last name from Finkelman in a previous generation, will be running the company the notorious anti-Semite founded in June 1903. I first wrote about Mark Fields back in December 2012 when Fields was named COO of Ford Motor Company. As a native Detroiter, I was asked to write the article for JTA and I remember typing quickly as I sat in a Newark Airport terminal about to board a flight to Israel with other Conservative rabbis. It’s no secret that Henry Ford was a notorious anti-Semite, and his company’s dealings with the Nazi Party during the Holocaust are well documented. But the company’s story has changed drastically in recent years. The Ford family’s donation of a rare 500-year-old Torah scroll to a suburban Detroit synagogue and the appointment of a Jewish chief operating officer demonstrate a marked shift in the company’s narrative when it comes to the Jewish community. The shift really began in the late 1940s when Ford’s grandson Henry Ford II took over the company and began hiring minorities, but it would take many more decades before Jewish executives were hired as officers. Mervyn Manning became the first Jewish officer of Ford when he became vice president in 1977. Today in Detroit, the Ford Motor Co. and the billionaire family are regularly seen as major contributors to the Jewish federation and the Jewish community center. Members of the Ford family and top executives at the company have been honored by local Jewish groups. And in 1999, Benson Ford Jr., a great-grandson of the auto tycoon, purchased the 500-year-old scroll and donated it to Temple Shir Shalom in West Bloomfield. The Torah was written in hiding between 1492 and 1560 in Spain or Portugal, where it was illegal to practice Judaism at the time. The latest chapter in the long history of Ford and the Jews began Dec. 1, when Mark Fields effectively began running the 109-year-old international auto firm. Fields, 51, has been lauded for his intelligence, skill and dedication to the company. He has worked all over the world for Ford, including a stint as the CEO of Ford-controlled Mazda. When Bill Ford, the executive chairman and great-grandson of Henry Ford, announced the appointment of Fields as COO it was obvious to all that he would be named to the CEO post in 2014 upon Mulally’s retirement. Mark Fields is the descendant of Russian and Romanian Jews. He became a bar mitzvah at a Conservative synagogue in Paramus, New Jersey. He tells the story that no matter where in the world he was assigned to work for Ford during his 25 years with the company his parents would send matzah for Passover and candles for Hanukkah. Fields and his family have homes in both Dearborn, Michigan and Delray Beach, Florida. He does not have membership at any synagogue in the Metro Detroit area. While Alan Mulally’s compensation at Ford in 2013 rose 11 percent to $23.2 million, according to the company’s proxy statement, Fields received total compensation of $10.17 million last year, which is up 15 percent from his $8.85 million compensation in 2012. Mulally’s total payout since coming to Ford in 2006 will be more than $300 million. ‹ Jewish Holidays? There’s An App for That!